On Tuesday of this week, a letter (with two appendices A and B) sent from 38 state medical societies and 33 professional medical associations to Lois Nora, MD, JD, MBA President and CEO of the American Board of Medical Specialties (ABMS) regarding the "contentious Maintenance of Certification (MOC)" issue was leaked to social media channels. There are no signatures, no letterhead. Just a single contact person with a Washington DC phone number to control the message? * After brief background check, it appears the letter was legitimate and the product of several influential medical groups' efforts to alter the ABMS MOC program and coordinated by the Association of American Society Executives (AAMSE). I was intrigued that a number of professional subspecialty societies joined with the state medical societies to request a meeting on 4 Dec 2017 with Dr. Nora to voice their concerns about MOC with the ABMS. Whether the ABMS will agree to a meeting or just use this meeting as another example of "listening" to more groups before fulfilling their own agenda remains to be seen. What is concerning to me, however, is that state medical societies felt they needed to ask Dr. Nora for a meeting when they are the ones that hold the ultimate accountability of self-regulation in their respective states. Shouldn't Dr. Nora be asking for a meeting with them? And why request a meeting with Dr. Nora on 4 December 2017 when she's planning on retiring later the same month? I worry about the political and business naïveté' of these state medical organizations relative to the specialty societies who earn considerable annual revenues from MOC and may be recruiting them. It is concerning that the circulated letter uses the same talking points as the ABMS and their member boards. This letter quickly shifts from the concerns about MOC to the talking point that "this is not about MOC but professional self-regulation." The same concern of the potential loss of "professional self-regulation" recently appeared in a JAMA opinion piece supportive of MOC by a former American Board of Internal Medicine board director. It was also mentioned in an earlier May, 2017 email blast from the American College of Surgeons who opposed the anti-MOC legislation in Texas. Impressive "harmonization?" There appears to be a consensus that using the strategy of holding loss of professional self-regulation over working physicians' heads will help us forget all that pesky corruption. Surely state medical societies do not want to buy into this kind of manipulation. Pity the poor physician who does not want to lose his ability to self-regulate his profession and rejects corruption. Where are they to stand? Might this talking point "harmonization" actually be a means to legitimize a "redirected" version of MOC? The only thing I might say in reply is these organizations only took us half way there. The current tone of this letter is not one of intolerance and repudiation of the corrupt ABMS MOC program, but rather a request to "redirect" it. In fact, this letter has a disconnect between wanting to "redirect" MOC with only two choices for practicing physicians: (1) propping up the current system of "professional self-regulation" or (2) something else. There is no clarity to the "something else." This is analogous to telling physicians that we'd better slip the Chicago alderman $200 per year, and be grateful for the protection. Why would state medical societies join in such a veiled threat? Our current method of ABMS member board "professional self-regulation" using MOC has proven itself to be corrupt and laden with numerous undisclosed conflicts of interest, self-dealing, non-transparency, and intimidating strongman tactics. Should we be grateful to ABMS for this, given the nebulous alternative? Let's get the ominous alternative on the table. And why in this letter is there no possibility of a third choice when an alternative model to MOC is developing in front of our eyes? Naturally, the National Board of Physicians and Surgeons (NBPAS) has a monumental shortcoming. It fails to guarantee millions in educational fees to many of the subspecialty societies on this letter. One can see how this third possibility just isn't as, well, fun. Perhaps that's the real reason this letter was released. Physician members of these specialty and state medical societies should be aware they are playing into ABMS's hand with this letter and should be up to date on the options and the evolving consensus regarding legitimate professional self-regulation. To that end, the integrity and transparency of the NBPAS should be promoted in lieu of the ABMS. Indeed, the state medical societies of Texas and Pennsylvania have played important roles in placing physicians and their patients before the financial concerns of subspecialty organizations and ABMS member boards. This should set a precedent for state medical societies across the country. What they should NOT be doing is begging for a meeting with a lame duck President and CEO of the ABMS who are only looking to grow the frequency and cost of MOC in the name of "professional self-regulation" since the ABMS and their member boards are the ones that got us in this mess in the first place. Radical reform of the corrupt MOC program is not paying the Chicago alderman $250 per year instead of $200. Addendum 26 Aug 2017 06:23AM - Appendix B added and the origin of the letter (AAMSE) added. * That individual, Hal C. Lawrence III, MD, ACOG Executive Vice President and CEO, has significant conflicts of interest with the ABMS. The American College of Obstetrics and Gynnecology (ABOG) are subcontractors for "Test Development" with the ABMS. Regardless of the motivation for producing and sending this letter to Dr. Nora, you can depend on yet another Deliberately Obtuse response from ABMS with regard to recognizing the corruption, coercion, abandonment of fiduciary responsibility, history of malicious prosecution and overall malfeasance associated with the status quo, to be followed by more #OstrichStrategy. This playbook is well known to ABIM Diplomates. As ABIM/ABMS, NCQA, NQF and the rest of the Quality/Certification Cartel depend entirely on asserting usurped authority never granted to them by the public to rake in millions of dollars while controlling the ability to practice medicine, it's time to stop asking them to do the right thing as they have zero incentive to do anything other than what they're doing now. It is clear we need to Federalize this entire process. Let the government regulate the regulators who are renting limos and condos and classic cars. It's pathetic that the ABMS believes they can "regulate" themselves. They clearly cannot. It is an organization that is too greedy, too stupid and too slow to respect the physicians who actually do real work for a living. Disband the ABIM. Get rid of the ABMS. Audit the all the Foundations and non profit IRS applications. Let the IRS and the Court of Public Opinion weigh in on a bunch of non-clinicians eating steak and drinking champagne while the rest of us take call and teach and do research. There is no evidence that MOC is needed or that it works or that it's cost efficient. It is unpopular, massively expensive and governed by a network of lazy, do-nothing bureaucrats who wish we would all ignore their ugly fiscal behavior. Why is the world of American Medicine and Surgery supporting an organization that relishes in stealing money from housestaff, fellows, clinicians just so they can run around in First Class plane rides deluding themselves they are "transforming" the process. It's a mirage. It's a scam. It's wrong and everyone knows it. It's time to stop telling the public that physicians can "regulate" themselves. We clearly cannot. So let an accountable organization like the Federal Government come in and flush the toilet. At least we can all go vote on Election Day and change what we don't like. My prediction on how this will play out. This impressive cornucopia of state medical organizations who no more represent their constituents than does the scorned AMA "have been brought" together to register their disquiet over ABMS MOC shennanigans. "Enough is enough they most politely cry!" After a period of "earnest and forthright negotiation" on our behalf, they will "unanimously" announce that they have brought ABMS to heel and approve the "new direction" of "lifelong" learning and MOC. Still expensive, still totally useless. Case closed. Done deal. Move on please and continue to "prove" to your patient your dedication to continuing excellence. 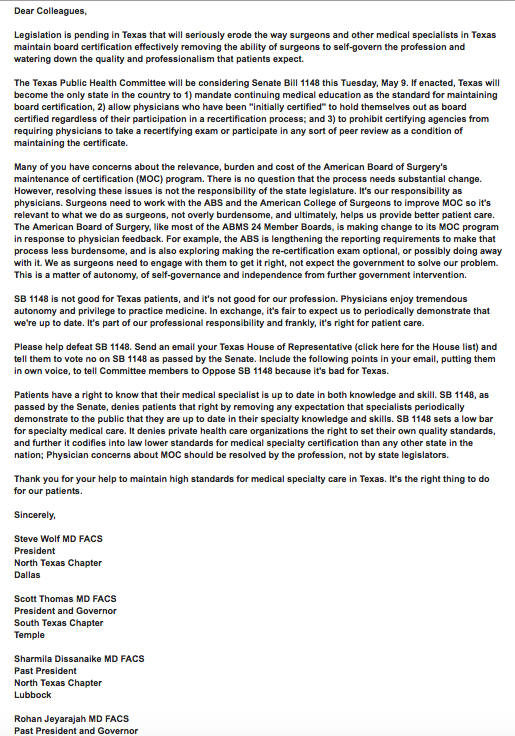 As the President of the Texas Medical Association rightly said ".. physicians in Texas and across the country... do not see the certifying boards as "self." I would say that these state medical societies are also not "self" and no more represent physicians' interests than the benighted AMA. Some real news about fake news from the grassroots media? Does the system really work or does it keeps unnerving facts from becoming public documents? 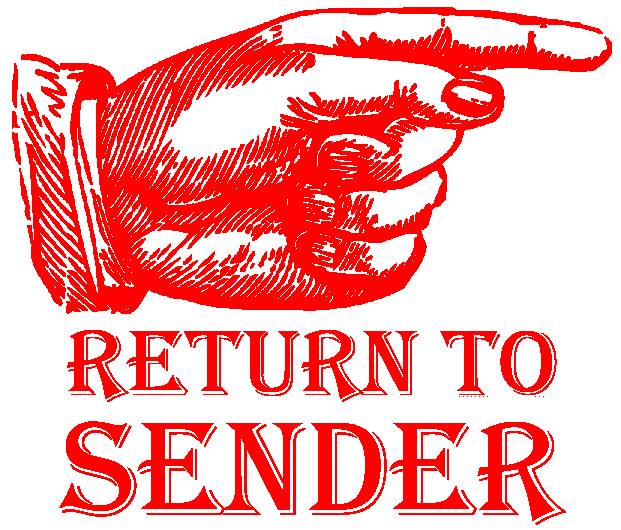 Did the judicial system work for Dr. Salas Rushford when a corporate bully (ABIM) and whoever they represent went after him maliciously in 2012? Certainly the system failed him and did not protect him from harm. Looking down the road: When ABIM settles with Dr. Salas Rushford uncomfortable truths will never be brought to light and become public documents. The Mannes deposition and other facts will never be made known. But, one important question is will insurance companies really willingly pay the multi-million dollar settlement? Or will ABIM be forced to pay from its own highly porous executive slush funds? The blindness of the ABIM and the cozy relations with the courts they have exhibited can only last for so long the more the real story of ABIM corruption gets blog attention and media exposure. ABIM has done its share of smearing diplomates, candidates and reporters. Now that ABMS has announced the heir to the throne it is apparent everyone will be expected to bow to the queen in Dec. and kiss the ring of MOC. King Richard will rule with an iron glove and the circle of corporate power will continue the charade of sitting at a round table speaking in behalf of 'we the people'. Slaughter of the innocents in the name of corporate profits is the reality. It has never been about democracy or keeping the subjects safe as they claim. Strange as it sounds the multi-generational agenda they cling to must be met with the same long-term vision and game plan. The seeds of MOC were planted well before 1933. Physicians need to be controlled for obvious reasons. Patient physician relationship has always been a strong influence. Even Tom Price has to pay the price and resign. Christine is gloating. Rich is pleased.